Amongst the treasures unearthed by experts Philip Serrell and Michael Baggott in Derby are a station wall clock, a unique collection of razors and a working toy train set. We've got a great crowd here of eager, boisterous owners. All enjoying the sunshine, aren't you? Yes! We've got the first signs of some interesting items, we've got a pair of likely-looking experts. Today, we're in the historic town of Derby. This was once a Roman town, and then later it became a major Viking and Saxon settlement. And one of the city's most historic and famous buildings is this, Derby Cathedral. Look at it! And it has one of the tallest towers in the country. Yet despite that, it's the smallest Anglican cathedral in England. But there's no time for sightseeing today. The queue is on its way in, and I'm desperate to see what they've got. Well, this is our venue for today, the Grand Hall in Derby's Assembly Rooms. as have our crack team of experts, Philip Serrell and Michael Baggot. They're eager to get started, so let's get things under way. -Joan, how are you doing? -So, tell me about these, then. at the British military hospital in Nepal. -So were you a nurse, doctor...? I was out there partly as a midwife on the female ward, but as a general nurse, as well. And you clearly loved it. I saw things medically that I'll never see again. -I'm not sure - is that good or bad? Oh, no, no, no, we won't go there, we won't go there! Did you join up to do your nursing, or did you join up to see the world? I joined up to broaden my medical base. Ooh, careful, careful. People at home haven't eaten yet, y'know! So, out in Nepal you bought these stones. "into jewellery that I'll wear as a memento." been put away in the safe and they don't come out now, I'm afraid. -on a gold chain, and then we've got our amethyst earrings here. And again, a gold set. And these are little peridots, aren't they? -One thing intrigues me with this, right? -Because I think the value of these, I would recommend that we sell these as one lot. And I think that we can look at an auction estimate of £60 to £90. We'll put a reserve on them of £60. -"was in Nepal, I bought some things there because I wanted to have some memories of my time there." -But I've still got the silver items. Ah, right, OK. I'll let you off. -and I hope that someone buys them who will really enjoy them and perhaps who will wear them. -crossed and let's hope that they do well at the auction for you. Cath, you've made my day. You've brought me a piece of silver. -Can you tell me where you got it from? who's now died, and it was always in a cabinet in her house. where it came from. I know now it's always been in her house for as long as I've known her. And then, when she died and we split up the goods and chattels, we ended up with the cup. Do you think it had a family connection going back, or...? but I don't think the initials are actually MW when you really study it. These script initials are usually very difficult to read, but I think it's HMJ. Those initials don't mean anything. I've destroyed the family story! mark, which is SG over EW, which is Samuel Godby and Edward Wiggin. -We've got the lion passant that tells us it's sterling silver. We've got the leopard's head crowned which tells us it was assayed in London. -And we've got the date letter, which is a lower-case r, which is for 1792. -And the last mark is the duty mark. That was simply to show that the duty, at this time sixpence an ounce, had been paid on this cup. And it's a lovely, typical two-handled loving cup. -which is why it's not the heaviest thing in the world. -..otherwise the handle would split. -that's quite thick. If you go down and feel that, that's a little bit thin. taken off, left a thin patch, which you couldn't re-engrave over. -So what do you do? You go to the other side and engrave there. -..is about the only thing against it. As a piece of Georgian silver, it's got a value. Any idea of what that might be? bit of work, it should be £200 to £300 all day long in the saleroom. So we can put it in for that and put a fixed reserve of £200 on it. in Derby - will be delighted to see it and have it in his sale. -Right. And would you get the silver polish at work on it before the sale? -People do ask me, "Should I clean my silver before going to auction?" Absolutely not. hands for about forty or 50 years untouched, and that's what all the collectors and dealers want to see. -So that will help it, if anything. -But we'll pop it into the auction and hope it does really well for you, Cath. -Oh, thank you very much! Who am I talking to? Mother and daughter. What was your name? Felicity. Right, OK. Well, you're holding this little doll. It's got a nice bisque head, actually, but I think it's quite ugly. This was yours, wasn't it? Yes. It used to go on the Christmas tree when I was a child. -Did it not frighten you? My sister and I thought the pinnacle of Christmas was to put the fairy on the top of the tree. -We thought it was lovely. -Well, it is a purpose-built fairy. It's got little wings on the back, hasn't it? You've got the wand, haven't you? -We have, but the little star has come off. And it used to be fixed in her hand. I don't know, I think it was sewn onto her hand. I'm not sure. So, when did you inherit this? -I've probably had it about five or ten years. -Ooh, no, longer than that. Since my children were little. -Yes, my children didn't like it. -I bet they freaked out. -They think it's a bit ghoulish. -Do you know, I do as well! to open my presents, and as I looked up and saw her at the top of the tree, I'd run a mile! -I'd go back to bed and hide under the sheet. -I don't really like it. She's never actually been on top of the tree any Christmas. No. I don't blame you. I think she's lovely. She's got a porcelain head. I mean, I like the idea. Composite arms and legs. They articulate. She needs dental work, that's for sure! Look at her teeth. and flutter, really, really does spook me. But she's in fact German. She's 1920s, and she does have a value and she is collectable for a doll collector, believe it or not. But the value's round £40 to £60, and it's not a lot of money. I think its social history is worth more. -So she can come out once a year. Peter and Chris, good of you to come to Flog It! What made you come? Just because we follow the programme and this has been in the loft and it's been the bane of the wife. -She's wanted to get rid of it. -You want to get rid of his childhood. She thought it might make some money. I mean, this is what? 50 to 60 years old? I'd say 60. I'm 63 so I was bought it when I was about five or six. -For something that's 50 to 60 years old it doesn't look like it's been played with. But it still looks... If we look at this train unit here, it's a Hornby train. It's London and North Eastern Railway, isn't it? -These were produced in the livery of the various railway companies. And it's clockwork. Does it work? -Ready to catch your end? Ready? If I send it round there I want you to stop it. -It's got reverse on it, hasn't it? I want you to prove that reverse works. Ready? There we go. Look at that. Brilliant. -Why would you let her bully you into selling it? -It's just taking up space in the loft. Yes, we've got grandchildren but they don't know anything about it. It's my son Andy who played with it a little bit but he wasn't allowed to play with it. That's probably why it's been kept in such good condition. I think it's a great thing. No, not really. £50, £60. Something like that, I would have thought. I think you're spot-on, really. We can put an estimate of £60 to £90 and we'll put a reserve on it of 50. We'll set off down the line. We hope it's not the end of the line. We'll go to the auction and get going. Here we go. Right, full steam ahead to the auction room. Let's have a quick reminder of what's on board. earring and pendant set is certainly exotic but will the bidders be allured by the taste of the Orient? silver and with a good pedigree, it should do well at auction. but will there be a wad of cash at the end of the line? and it's also home to our very own James Lewis who's gonna be on the rostrum flogging all our lots. Philip, Pete, good luck. The Hornby train set, a lovely box set. It's just about to go under the hammer. Any regrets? -Not at all. Let somebody else enjoy it. Let's hope we get £90. -It has been played with. It's been used. Yes. But collectors are fussy people. This could go through the sky, we don't know. If we don't get derailed I don't mind. It's going under the hammer now so good luck both of you. Hornby trains. The 201 tank goods set etc. I can start bidding here at £45. 45, 50. 50 anywhere? At £45. And 50. 50 and five. 60. At 55 has it. 60 now? 60 anywhere? At 55 I'm selling. £60 in the third row. At £60, sir. Five anywhere? At 60. All the bidding very close indeed. It's gone now, £60, a good result. -You're taking the kids away. -The grandkids away to Majorca to their uncle Andy's. I thought the Andes were in America. No. On the end of your armies! I love this next lot. It's a two-handled loving cup and belongs to Cath. We got the cup but we don't have Cath. We do have her son and daughter-in-law. What's your name? Thank you for being here. Where's Mum? -Is she? On the phone later, then. Hopefully with some good news. -We've got a fixed reserve at £200. A nice domestic piece of Georgian silver. That's what they make, so hopefully there'll be someone here, a member of the trade, happy to pay that. A packed house. We'll find out any second. It can't go for a penny under, can it? Mum will bash you! Let's not upset her. Let's hope it sells at the top end. 1792 and two bids on it. 190, I can let it go just, I think. 190. 200? 200 is it? At 190 with me, do I see 200? 190. It says firm. Do you want me to use discretion? -No? At 190, all done. Oh, that was just so close. We got strict instructions to stick to the reserve. Yeah. If that was what Mum wants. Bearing in mind you do have to pay commission so you will be losing a bit more money as well. Joan's earrings and necklace are up next with a value of £60-£90. Joan, you're well travelled because the stone was bought in Nepal. in Hong Kong. Now we're flogging it here in Derby. I never thought I'd hear you ask a lady if she was well travelled. -You can't say that to a lady. They'll sell and sell well. Let's find out what they do. necklace, conforming earrings, set with the purple and green amethysts. I can start the bidding here at £50. And five do I see? At 55. 55, yes. 55 and 60. 60 now. 60 standing. 60 and five? 65. 70. At £65. At 65. That's OK, isn't it? Mid-estimate. What will you spend that money on? I've got guttering needs repairing. You've got to get your down pipes sorted. Well, that's it. You've just seen our first batch of antiques has gone under the hammer. to nip up the road and visit a great British icon. First, I've got to hail a cab. Here's a few clues as to what I'm going to see. A quarter of all British people take this on holiday with them. the visual properties of industrial lubricant. It was a sort of standard part of the ration packs for soldiers during the First World War. Of course you have! It's Marmite. Marmite, that tangy savoury spread. You either love it or hate it. That famous black jar with the yellow lid, it's so quintessentially British. Marmite was first developed and produced here in Burton in 1902. But its connection with the town is more than just coincidence. The first person I'm here to see today is head of production, Mark. It's all going on in there. I want to know the ingredients for Marmite or is it secret? There are some secrets. The main ingredient is brewer's yeast. but there are some little bits of tweaking that we do with the product at the end of the process. I'm afraid that is top secret and you'll never know that secret. That's obviously hence the connection to Burton and the brewing industry. Is this the only Marmite factory in the world? It's not. There are two, one in South Africa and this one in the UK. We are supplying everywhere in the world except for South Africa for Marmite. Just standing here talking to you for a couple of minutes is making me feel rather angry. The smell in there is absolutely delicious. It's nice, isn't it? Yeah. Well, here's a pallet ready to be loaded up on to a lorry. This one, my word, it's going all the way to Canada. that's enough to fill 25 million little jars. And it's the black glass with the yellow lid, and I've got one here, that makes this product so iconic. But how did it come to be this way? I was keen to learn more about Marmite's history. And how the brand has evolved and changed through the decades. I was meeting up with packaging and brand expert Robert Opie. well, it's a very small part of your collection, I know you've outgrown the house now, haven't you? in Notting Hill in London where you can come and see a lot of this. -Full of thousands of products. -Thousands and thousands of products! What I want to know today is, just talk me through a little bit of the potted history of Marmite. Right, well, in fact the story goes a bit further than 1902, when Marmite arrived. discovered you could extract meat from a cow and put it into a jar. And he produced Liebig's Extract of Meat, which was on sale in this country in the 1860s. how can I make brewer's yeast into something which was nourishing? And he did actually find a solution to that. So where does the name come from? Well, Marmite is actually French, marmite, and it's French for a stewpot or stockpot. And there it is on the front of a label, it is essentially the trade mark. And it has stood the testament all the way through this wonderful history, there it has remained. And you see the early pots, these straight-sided pots. Now, I don't actually have one of the first pots in my collection. I'm still looking. Somebody, please send me one. from the advertisements, thankfully the advertisements give you the clue. decided, OK, we're gonna do something a bit more special. and of course then the box became the firm favourite, it gave you something really exciting inside it. -Where do you find all this? they turn up in people's homes, in shops, all kinds of different places. I've heard of Oxo cubes, I've seen them, I never knew there were Marmite cubes. No, well, Oxo cubes arrived in 1910, and towards the end of the 1930s, the Marmite cube arrived. And you find these wonderful tins - elegant, aren't they? The trick, though, is to find the contents as well. And actually in this one you still have the original cubes in there. How long was that in production? Not that long because the war arrived in 1939, and that dished it altogether. We've had the same shaped bottle since the 1920s, has it been the same ever since? and ended up with just the straight-sided ones. It really has stood the test of time, have there been any recent changes at all? was when the traditional tin lid went into plastic. and it didn't feel right to have a plastic lid. I discovered people scooping out from the old jars into the traditional ones. So that was a traumatic moment. And recently they've brought out some sort of new flavours, like Guinness. particularly if you connect two great brands together, what fun. And now you've got the convenience of squeezing it onto your toast. and I think we're now in the squeezy generation, aren't we? Well, you are a brand expert. Does Marmite really stand out as one of the most iconic? designs that stood the test of time, it's up there with the leaders. grown up with these amazing brands, and they become part of our lives, we do actually love them. Well, it's been fascinating to learn a bit more about Marmite's iconic brand. Who'd have thought a handful of brewer's yeast would give us one of the country's best-loved spreads? Let's hope that little black pot with a yellow lid is around for at least another 100 years. Right now it's time for me to join up with our experts back at the valuation day. Janet, I hope your mantelpiece isn't bare from bringing these in today to us. No, they're not on my mantelpiece. They're super things, can you tell me where did you get them from? -I've had the Naples vases since 1971. And they were given to me partly in memory of a friend who died. I see, a lovely remembrance. And where did the little pots come from? when she did a swap for some childhood plates in the Victorian age. they're lovely little hand-painted vases and hopefully there's a mark on every bit of China that we see. And it's Limoges Art China, France, which basically tells us all we need to know about them. I imagine they date to around 1910, 1920. And it's nice to have a small pair, the gilding's slickly worn there. and this bas relief decoration around the front. -And it's entirely Grecian and Roman in feel. -Oh, it is Roman in style? -But they're not my style, really. They're not everybody's taste, are they? They're a little bit full-on. But, erm, they are very interesting. The one thing I would say is that we've got an exposed rim here, with no glaze on it. -That would suggest that originally that both had little covers. -I've never had the stoppers. No, well, it tends to be that if one gets broken, the other gets put away in a drawer so they look the same. And then of course they're separated and lost forever. You say they're not on your mantelpiece, are they on display at all? They are actually on the sideboard, amongst a lot of other things! So you've got a forest of China! You won't miss a couple of trees out of the forest. The market for them has declined a little bit in recent years. Everybody wants Poole Pottery, they want Troika and they want Clarice Cliff. And they've moved away from the more traditional areas. But still these have a nice decorative feel. Did you have any idea what they might be worth? Well, I wasn't really sure what they were worth. -Right, it's not fortunes, I'm afraid. -No, I didn't think it was. I think the small pair of Limoges vases are worth between £30 and £50. -With the wear and the fact that they're not the very best Limoges quality. and we could put a fixed reserve of £30 on those. The Naples vases are a bit bigger, a bit more imposing. Even lacking the covers, I think £50-£100 for those. -It's a broad estimate because missing their covers, we're not entirely sure what they'll make. -would you be happy for us to put them into the auction for you? Splendid, well, we'll do that, and hope that we have French and Italian collectors on the telephone! -Thank you so much for bringing them in, Janet. -Colin, how are you doing? -Yeah, pretty good. And this is your collection? Just one word, really, Colin - why? -And it started you off collecting razor blades, razors and shaving accoutrements? I'm not quite sure they're valuable but they're just great bits of social history. No flies on me, clearly one for every day of the week. -and this unscrews and drops into there. Brilliant, isn't it? And this is absolutely lethal, this thing here, look. No, it's actually comes as a huge relief to, that, to me, Colin. I mean, you've got everything here, haven't you? lady's one here. I'm not sure what ladies would do with it. Where do you get razor blades for that from? -It's a lady's boudoir razor. -There's a road we don't want to go down. I'll swiftly put it back in the box then. Dear me. How long have you spent collecting these? 1975 I started with the first Rolls razor which I found in a little antique shop. -What a piece of engineering. -Have you ever thought about counselling? This is only part of your collection, isn't it? -How many are there in total? -I would think 40 to 50. -40 to 50. Why are you selling them? They've been in the loft space now for quite a long time. because people throw them away sooner than save them. So, I thought, they might go to another home. Somebody who wants a starter kit for the same thing. got a clue what they're gonna make, really. I think they're interesting. let's just say a narrow market. -Do you want to sell them? -They've just got to go. -Whatever they make they've got to go? that some of the ones you've got I think they'll sell and sell well. -how many shaver collectors there are out there in the world. -What we really want is Mr Gillette at the sale. Absolutely fantastic, this is what I wanted to see here today in Derby, something with local interest. -Look at it, it's written all over it, Maurice. -Thank you very much for bringing it in. And Aileen, isn't it? I'd say this is around circa 1880, the late Victorian period. What I want to know is its story. Well my uncle got it off the station when they pulled the station down. -you know waiting room signs. -Which is big business, isn't it? -It really is, it's very collectible. -Because everything had got to go. -Oh, it's lovely and I bet it keeps beautiful time. Every weekend I wind it up and give it a polish. And you have no trouble with it. You know, it just ticks away. I've got to ask, Aileen, why do you want to sell it? -Well we thought we could do something with the money. -Something else we might like to do. -What would you like to do with the money? Well I'd like to purchase a new television. -A new telly, a big flat screen one, I guess. -Then we can see Flog It! Clearer! Well let's just take a closer look at the movement, shall we? They made 'em simple in those days. -Do you want me to move that for you? Yeah. That's nice, let's just take a quick look at this. That's access to the movement. That's access to the pendulum. Yes, to adjust the pendulum and here's the pendulum. Great and you've got the key, fantastic! OK, now let's have a look at the movement. The condition's fantastic, isn't it? -You've looked after this, haven't you? ..perfectly. I can put this near my microphone and you'll hear this. It's absolutely lovely and here is the pendulum. That is your fine adjustment. You can move that up or move that down to slow the clock down or speed it up so that it keeps good time. Well, I would like to think this would fetch, in auction, around £600. Hopefully a little bit more on a good day with two people bidding against each other. -to catalogue it at 400 to 600 if that's OK with you. How about a fixed reserve at 400? -Yeah, because I don't want this clock to go for a penny less. Can you make the auction in a month's time? -I don't think we can, we're booked on holiday. -Oh, you're going away, where are you going? We're going to north Devon. Oh, are you. For a couple of weeks or a week? for you. It's in good hands and I'll let you know exactly how it's doing. gonna get your telly and you'll also have a fantastic holiday. Thank you very much for taking that trouble for us. It's auction time again and here's a quick reminder of what's going under the hammer. Two pairs of matching vases was more than enough to catch Michael's eye. They've been entered as two different lots, so which pair do you think is gonna make the most? practically impossible but with no reserve, it's going to go. Maurice and Aileen's wall clock is without question my favourite item of the day. top end but nothing is guaranteed when it comes to auction. I wanted to grab auctioneer, James Lewis, to get his point of view on that lovely station wall clock. James, a bit of local interest. Yes, I have to say, it doesn't get any easier than this, a clock from Derby. When Maurice walked in with this I thought, "Yes, that's the clock." It's the right size, it'll suit anybody's kitchen. -His uncle got this when the station was shutting 50 years ago so it's got a lot of history for him. I had to prise it off him with a £400-£600 estimate and he was rather hoping for £800. I think 800 is steep. I think you've got it absolutely spot on. We've sold an awful lot of these. I mean, Derby is the hub of the railway industry of the whole UK. anywhere else, so we sell these week in, week out, week in, week out. If we can't sell this there's something seriously wrong but I think your estimate is absolutely spot on. Well let's hope we get the £600, fingers crossed. I gather, Janet, you're selling these Naples vases because they're gathering dust. Well, I've got to downsize because I might have to go into a home. Well we're all getting a bit old, aren't we? Every second of every day, unfortunately. Do you like the vases? -Will we get the top end of your estimate? They're not really my cup of tea but I was given them 40 years ago. someone will absolutely love them and they'll be in this room today. Sadly lacking their covers but still a good shape to them. And £50 for them, please. 50? 5 and 50. 50 and 5... 55 and 60. At £55 it's with you. -We've sold them, oh good. We've got those two Limoges vases. -What will we get, top end, come on? I think £40 is a fair price for them. Happy if we get 40? -We'd like a bit more but we'll settle for 40. -Whatever we can get for them. -OK. This is it, good luck. The pair of Limoges ovoid ewers. Nicely decorated, two bids on them, one of 25, one higher. £30 starts it. 30 and 32 do I see? at 42 at the back. 45 now? we've got Colin's razor blades with accessories going under the hammer with a valuation of £20 to £40. what these are worth since we don't sell too many razor blades. Somebody's gonna buy them but I have to say I don't know why. No and you're gonna say it's gonna be a close shave. -It's going to be a very close shave. The collection of razors, where shall we start that, £20 for it. £20... 15 if you like. Who wants it at £10? Anybody want those? £10. James, you could do with that. Yeah, I could do with them, couldn't I? Anybody want them? They're out of fashion. -That's the problem. Anybody want them? I think this is gonna be a Flog It lowest ever. £5 in the corner at 5, shall we see 6 somewhere? Give him some competition. 6... at £5 to the left. All done and selling at £5, are you sure, is that OK? £5 in the corner. Anywhere else? -You're happy though, aren't you? They've gone to a collector, hopefully. Hopefully they have, yeah. Somebody who'll start a collection now, who knows. -Are you gonna collect anything else, are you gonna buy anything else? -Definitely not. That's the end of that. Time is now up for Maurice and Aileen's station wall clock. they're on holiday but we've got Lorraine, the daughter. Did you see this little clock as a child in the house? -Yeah, it was always there. Yeah, kept you awake when you slept downstairs. What did you say to them when you realised they were gonna flog this? -Were you a bit upset? -They didn't tell me straightaway. They waited until I noticed. Then I went, "Oh, right." You noticed the missing space on the wall and went, "Mum..."
I know they've been decorating. I thought they'd taken it down for decorating. I guess they need the money, they want to move on. We're looking for £400 to £600 and it's going under the hammer. This is a great lot. And, a lot of interest. -One, two, three, four, five, six, seven, eight, nine, ten, 11 bids on it. Loads of them and I'll start it at the lower end of the estimate at 400 and see how we go. At £400 and 20 do I see? At 400, 420 in the room. 500 standing, at 520 seated. It's the best one I've ever seen. It's worth it. 920 if it helps you. 920 or 50? 920, 950? 980... 1,000, round it up? Sure? 980, on the phone at 980. Yes! Crack, that is a sold sound. £980, Maurice is gonna be so pleased. That's gonna make their holiday. -Get on the phone straightaway. -Thanks for being a great stand-in. There's not a profit in that. Well, that's it, it's all over for our owners. bidding as I'm speaking but I've got to say what a cracking day it was. I wish Maurice could have been here. He's on holiday in the West Country but his little clock sold for a staggering £980. You can definitely say time is up and sadly it is for us as well today. 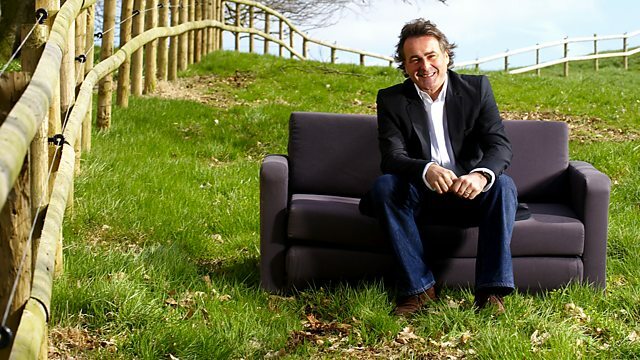 Paul Martin and the Flog It team are on the hunt for antiques, this time in the historic Derby. Amongst the many treasures unearthed by experts Philip Serrell and Michael Baggott are an elegant, Derby-made station wall clock, a unique collection of razors and an immaculate working toy train set. Paul also gets a taste for a great British icon of design, as he visits the Marmite factory just down the road in Burton-on-Trent.